I like Lisa’s historical novels, so trust her to do something suitably cheery! I’d Tell You I Love You, But Then I’d Have to Kill You by Ally Carter – Having lurved her Heist Society series, I am hoping this one will be just as awesome! Rotten by Michael Northrop – Basically, if you put a dog on the cover I will buy your book. The Iron Thorn by Caitlin Kittredge – As I suspected, this book is even more gorgeous in real life. Twinmaker by Sean Williams – This is my second copy of this book (sent for review), so…. giveaway! Feed my Reader is my excuse to highlight the latest e-book additions (a-la Showcase Sunday/Stacking the Shelves/Mailbox Monday). Ever since I made the executive decision to expand my e-book collection (and save space) I’ve gone a bit e-book mad. I’ve already read this one and… I was not a fan. It had a few good points but overall it wasn’t the best. I adore the beauty and the beast tale, so I am loving the idea of this sci-fi retelling. I got the second book in this series at BEA so… yeah. Need to read the first first! I’ve seen very good reviews for this series on goodreads, so I am rather hopeful. I was reminded about this series when the second book came out and finally nabbed myself a copy. I’ve heard somewhat mixed reviews about this one: some people loved it and others were rather “meh”. Since I am a big werewolf fan, I really hope I enjoy it! 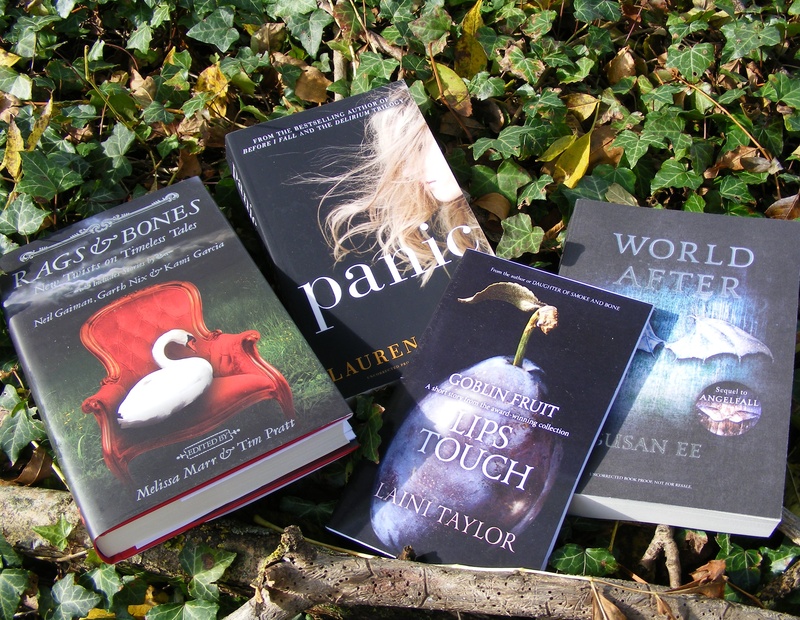 I got some absolutely gorgeous review books this month – every single one of which I am super duper excited about. Here’s what I’ve received/bought lately a-la Showcase Sunday/Stacking the Shelves/Mailbox Monday. Rags & Bones Anthology – I love the idea behind these stories. I love retellings and the list of authors involved is impressive. Panic by Lauren Oliver – I’ve only read one of Lauren’s books, but that’s enough for me to know she has a way with words. Also: this is a standalone!! World After by Susan Ee – This one is rushing to the top of my TBR pile! I loved Angelfall and cannot wait to start the sequel. Lips Touch: Goblin Fruit by Laini Taylor – This is an excerpt from Laini’s book Lips Touch. I need a final copy! As I said, yup! I am super excited about these books. Looking forward to seeing what y’all received this week! I just had to support this book. Serious kudos to the publisher for going all out with the cover! I’ll admit it: I’ve never read Lauren’s Chemical Garden series and… I probably never will. The premise just never really appealed to me. But Perfect Ruin drew me in with the words “floating island”. I just have to see what they are talking about! No idea what to expect from this book, I just knew that I had to have it. I’d never before seen a nephlim as the hero/heroine of an urban fantasy novel. I know Armentrout has a lot of fans, so I really need to try out her work.